I really love making to do lists, I find it really helps me keep on top of everything I have to do and after the success of my January to do list I wanted to do a new one every month in the hopes that I can keep myself motivated. 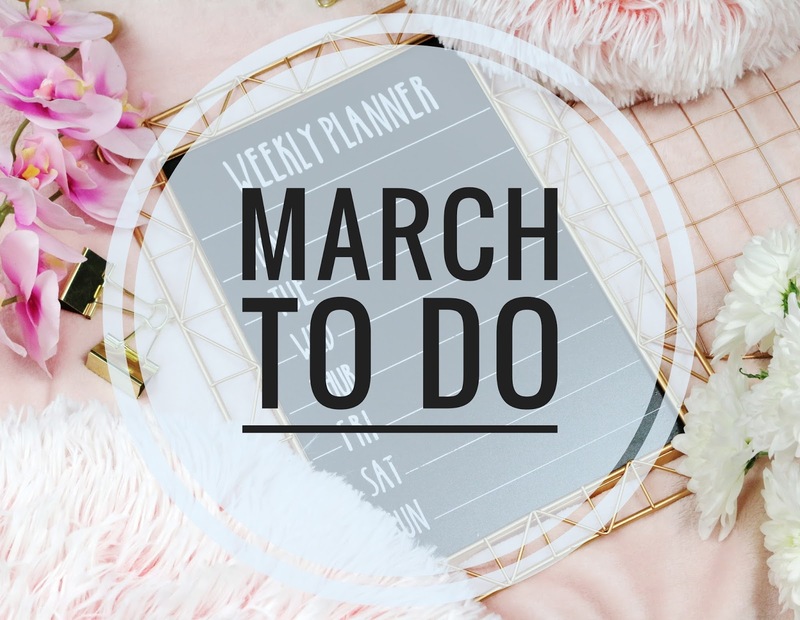 Unfortunately due to my health I wasn't able to keep on top of my February to do list but I have high hopes that I will be able to clear my March to do list and achieve everything on it. ● Buy a new eye cream - I am really getting on top of my skincare right now, I feel like I haven't been as serious as I could be about it so after doing lots and lots of research I have made a skincare routine that's hopefully really going to work for me. For this skincare routine I do need a good eye cream though so I am on the hunt for one that's going to suit me. ● Get a pillow sleep spray - I keep saying to myself that I need a new sleep spray but I haven't actually picked one up yet and I probably should. I love using them as I feel a sense of calm when I do and I know it sort of helps me sleep better. ● Drink more water - I was doing so well with drinking more water at the start of the year but now I feel like I just don't get enough so this is definitely one thing I really want to achieve. ● Have an arts and crafts day one day a week - Leon is at an age where I really want to stimulate his mind. He loves playing with his cars and such but I wish he would want to sit down and create more with paints and such so I am going to set up one day a week where I put all the arts and crafts stuff out and we spend a few hours making things. I have researched a few crafts for us to tackle so I am hoping this will be fun for him. ● Use my Salon Gift Voucher - I got a gift voucher for a local salon at Christmas which I still haven't used yet so I would like to use it this month on maybe a deep tissue massage or something like that, just have a complete pamper day. ● Have a weekend away - This last one is cheating almost because I know it's already happening haha At the end of March I'm being whisked away for a surprise weekend which I am SOOOOOO excited about, I think it's well needed to say the least. And that's my March to do list. I am keeping my fingers crossed that this month my health will be better making all my goals achievable. ● Plan a really nice not valentines day, date - This worked out pretty well if I am honest. I planned an xbox night with a takeaway which was good but I wish I was able to do more, just annoyed my health stopped me being able to. ● De-clutter all my DVD's - As my health hasn't been the best through February I haven't managed to do much and de-cluttering my dvds was on the bottom of the list so I didn't manage to get this done. ● Get a lovely new Jumper/Top - Again, my health pretty much brought the whole month to a halt for me and this meant no shopping sadly, maybe in March I'll get one. ● Get something from Lush's new Valentines Range - Nope, didn't get anything.... BLOOMING HEALTH STOPPING ME GOING OUT! ● Make some cupcakes - This one... This one I actually achieved!!! Leon and I made some cupcakes for him to take to nursery but then all the snow happened and he didn't go in so we ate them all. They were yummy. Februarys to do list really didn't go as planned at all, My health was really bad, so much so I ended up in hospital and then little bears health went down hill as he caught a horrible Viral and it was just a waste of a month if I'm honest. I am hoping March goes much better. I love this post. I do to do lists but they mainly consists of tidy house sort out this sort out that. I need to incorporate more things like buy a top. Go away for the weekend. This us great I am inspired. Thanks for sharing. I'm the same with water! I was doing super well and now I feel like I'm just dehydrated all the time, ugh.